The first real frost of the winter. Cold but bright! Yay! 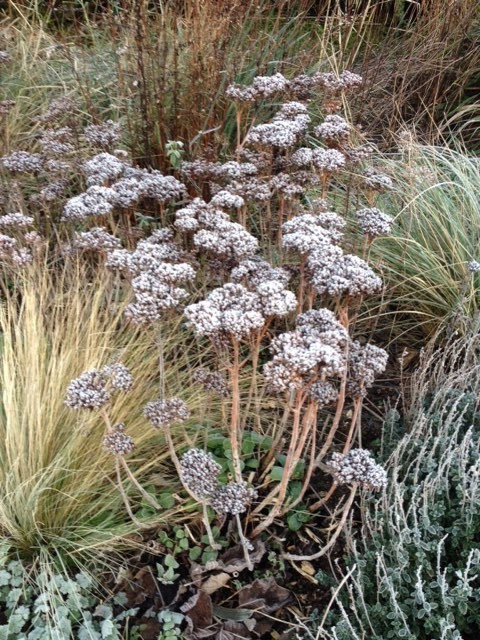 The Echiums outside my front window are wilting in response, their giant leaves drooping earthwards. But apart from them, very little damage. 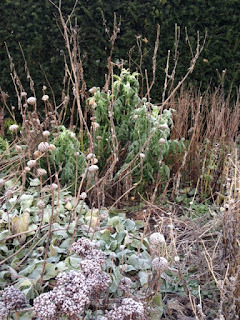 Crunching over the crisp lawn to admire the frosted seedheads in the long border I was so glad I had planted a Prairie style border where all the grass stems and seed heads were mostly still standing,making a perfect receptacle for the frost. I have waxed lyrical about leaving seedheads in the garden before but a lacing of frost over a sedum head or phlomis russeliana takes some beating in my view. But this season there is a real conundrum which you may be able to notice from my next picture. 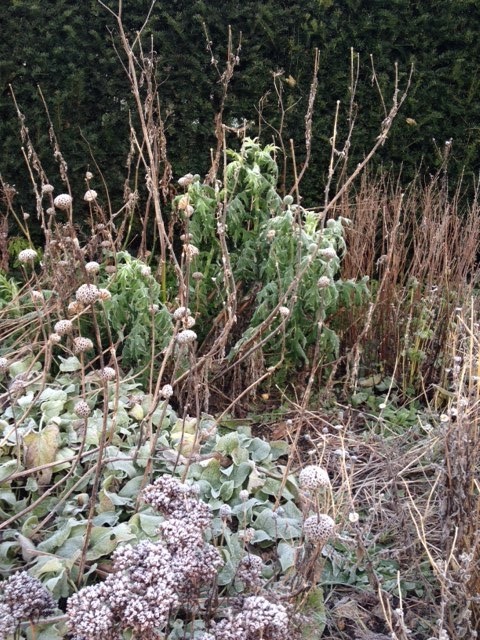 In the foreground are the frosted seedheads of the phlomis and sedums but wilting behind are the emerging foliage and buds of a sulking echinops ritro, tricked into believing it was spring and now hammered by frost. Not sure how this is all going to pan out but will just continue to observe. 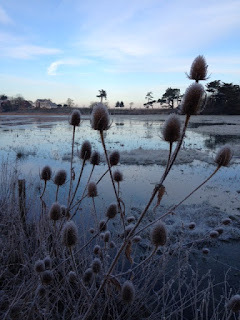 My cycle ride along the Causeway was also a joy with memories of childhood jumping on icy puddles, anticipating the crack and groan as the ice gives way. It's the first time this path has been crisp and crackly underfoot rather than wet and sodden so I careered along it, quite the girl racer. Stopping to gain my breath I admired the seedheads of the tall architectural thistles of the teasels and the banks of natural rushes as well. Both reminding me that nature does it so much better! The low bright winter sun, danced across the rivulets and frosty marshes catching the dazzling white of upturned wings in flight across the river. With just the lonely cry of the curlew and the cheery chatter of the canadian geese for company I felt curiously energised and 'in the moment'. Back at home Joe had arrived to begin a massive cut-back and sort out of our overgrown shrubs and climbers. Brambles had invaded a Holly tree, the Magnolia needed its lower branches trimming, the Bay tree was in need of a bold hack back and the Vitis coignetaea which was planted at the base of the archway had climbed across the whole front of the house and tangled itself in the bamboo, guttering and downpipe. Reinforcements were definitely needed. Working at ground level, cutting back clematis, raking leaves, deadheading crocosmia and other late perennials I became very concerned about damage to other early appearing plants. I had to tiptoe around primroses, pulmonarias and anemone blanda all in flower, trying not to break their fragile leaves.